This series’ first “highlight” was Rick Tocchet of the 4th-seeded ’84-’85 Flyers being ejected for head-butting. What a classic “Flyers” way to start. Anyway, the first period of Game 1 featured a PP goal from Gary Dornhoefer, which would be the first of two PP goals for him, as the top-seeded ’74-’75 Flyers won 4-2. The ’84-’85 Flyers scored two late goals in the first period of Game 2 to lead 2-0 at the start of the second period. However, by the start of the third period, the game was tied after the top seed received goals from Dornhoefer and Bobby Clarke. Almost five minutes into the third, Dave Poulin gave the ’84-’85 Flyers a 3-2 lead. Then, just past the halfway point of the period, Dave Schultz scored an unlikely goal to tie the game and just two and a half minutes later, Bob Kelly scored the eventual game-winner to give the top seed a 2-0 series lead. The scoring in Game 3 started just four seconds into the game as Bill Barber gave the top seed a very early lead. However, they needed two goals late in that opening period to lead 3-2 heading into the second. A goal each from Brian Propp and defenseman Mark Howe gave the ’84-’85 Flyers a 4-3 lead into the third period. Clarke tied the game six and a half minutes into the third with a PP tally. Later in the period, with about three and a half minutes left, to be exact, Rick MacLeish potted home a PP marker of his own to give the top seed a 5-4 lead. However, less than two minutes later, Tim Kerr tied the game for the ’84-’85 Flyers and that forced overtime. Clarke scored the game-winner nine plus minutes into overtime to give the top seed a 3-0 series lead. On the backs of two goals from Kerr, the ’84-’85 Flyers led 3-2 after two periods. 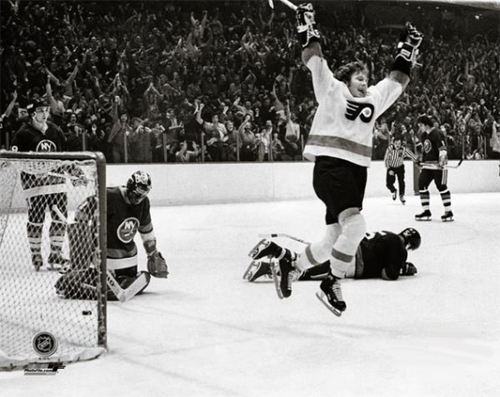 However, the ’74-’75 Flyers scored two unanswered goals in the third to complete the sweep with a 4-3 win. The other Semifinal matchup pits the 2nd-seeded ’73-’74 Flyers against the 6th-seeded ’86-’87 Flyers! This entry was posted in Qualifying Tournament, Ultimate NHL Playoff and tagged Bill Barber, Bob Kelly, Bobby Clarke, Brad McCrimmon, Brian Propp, Dave Poulin, Dave Schultz, Gary Dornhoefer, Mark Howe, Rick MacLeish, Rick Tocchet, Tim Kerr, Ultimate NHL Playoff. Bookmark the permalink.